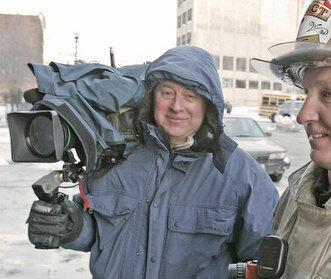 At the age of 71 in 2009, Nat Whittemore brought down the curtain on a 55-year photojournalism career at WBZ-TV, Boston’s Channel 4, and a television news business he helped shape from its earliest days. Whittemore’s coverage of breaking news and especially fires brought him countless accolades from community leaders, firefighters, and his own professional peers in the business. He remains active today in the “Boston Sparks Association” and as a volunteer with its Boston Fire Museum. A lifelong Wellesley resident, Nat is the father of Wellesley Police Lieutenant Scott Whittemore.